Home → Uncategorized → CHECK OUT WHAT OUR CUSTOMERS HAVE TO SAY ABOUT IRC! Best customer service ever!!! And very reasonable prices. Family owned business and operated. Very knowledgeable about all the different types of printers and ink! Definitely would recommend!! 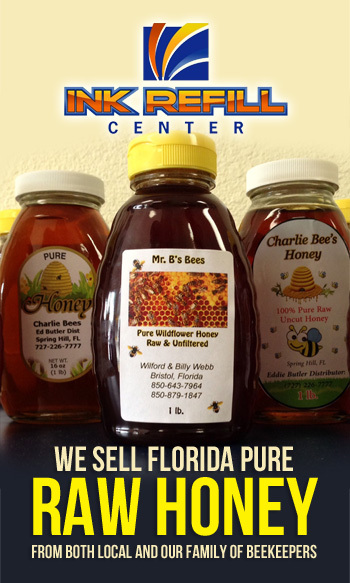 This small business is one of the best in Hernando County! They are amazing with their customer service and with their product. I have only been in once when what I needed wasn’t readily available. I now know that if I buy a new printer, I need to call to make sure they have the latest sizes of ink for the newer models. They ordered the product promptly. Super prices, excellent customer service, and free delivery. Did I mention great prices? Up to 50% off retail prices and the extra bonus of supporting a local business, I wouldn’t go anywhere else for my ink and toner needs. I love coming here. I have came here several times and always received great service. This last time I had ink filled several months ago and never used it. I tried to use it the 9ther day and it didn’t work. I brought it in and told a guy there (I completely blanked on his name) what was going on. He gave me a new cartridge with no problems because the ink had dried up. This place definitely stands by what they sell you!!! Response from the owner a week agoJessica, thanks so much for taking the time to comment on your experience with Ink Refill Center. We strive for excellence in customer service. We appreciate you and look forward to serving you again! Best place for printer refills and honest advice! Highly Recommend! 5 stars! Thank you Matthew. We appreciate your review and we appreciate you! Super fast service and great customer service. The product is better than anything I have gotten at Walgreens. The ink lasts a long time and quality is GREAT! The best and only place in town to get your NEW or Refilled Cartridges and more. Excellent Personnel and Superior Customer Service. Thank so much for the kind review! Thank you Maria! We appreciate you and look forward to serving you again. Thank you! Our customers make our day! I found this little shop one day a few years ago and have not bought another ink cartridge from any other retailer since. This place is great. The folks that work here are friendly and knowledgeable, they are a great asset to our community. I recommend this shop to everyone I know…why pay huge retail prices when Ben and his crew can hook up your ink needs at a tiny fraction of the cost? We need to continue to support local business’s or else Spring Hill will just be Walmart. I’ve never been able to find a retail store that has satisfied my ink and toner needs like the Ink Refill Center! The warm and friendly staff makes every experience an excellent one. All of the employees know me by first name and sometimes you just wanna go where everybody knows your name! Especially in this day and age where big box stores such as Target, Wal-Mart, Best Buy and the likes rule this country…it’s nice to find a local place where the employees actually know what they are talking about! When I was in the market for a new printer for my home office the owner gave me a recommendation. I went out and bought the one he suggested and I’ve been very happy with it. The delivery service is great and very convenient, especially for my small business needs. I don’t even have to think about running out of ink anymore because the Ink Refill Center is always there when I need them. I highly recommend them for business and personal use!! Everyone that I have referred to Ink Refill Center has been very happy as well. Even if you aren’t local, the Ink Refill Center can still effectively and affordably meet your ink and toner needs! I wish I would have known about this store years ago. I saved money on my toner cartridge and it lasted longer than the new ones I normally buy!! Thanks so much for your 5***** rating, Vicki! We appreciate it and look forward to serving you again in the future. Thank you for your 5* rating! We appreciate you! Hi Stephanie, thank you for the 5* rating! We appreciate you and look forward to serving you again. I was having an issue with my printer and the colors just not printing properly. I couldn’t figure it out. Spencer came to my house and worked diligently on the printer until it was working correctly. As a local real estate agent, I can’t tell you how nice it was to be able to be productive on my computer, while Spencer worked on my printer. That was 1.5 hours of income generating time that I was able to devote to my business rather than deal with a printer issue. He was kind, professional and listened to my concerns until they were addressed. I was extremely impressed with this service. Ink Refill Center Thank you Elizabeth. We are so appreciative of your kind words. Your Ink Refill Center Team takes great pride in delivering exceptional customer service. We are all about making you successful and happy. Thank you for recognizing Spencer. We look forward to serving you again. Being new to the area I was afraid I might be stuck having to buy new ink cartridges from one of the big box office suppliers or worse yet…Wally World. I met Jim at a network event and got a ringing endorsement from Bob Hoffman. Then I ran into Deb at another network event. Needless to say that little light came on so I took two cartridges up to the Detona Blvd office and got to meet just about everyone in the company. I got a quality set of both black and color cartridges. And get this….for around 50% less than Wally World. So trust me… If you need a quality refill…this is a top quality operation at very affordable prices. And we all know how accountants are looking for ways to cut cost. As an individual that has been involved in Customer Service for over 45 years, I can honestly say, Deb and the Ink Refill Center have demonstrated to me that they are dedicated to Customer Service beyond belief. I have been purchasing ink for over a year now at half the cost of the Big Box discount stores and have been completely satisfied with their product. I have had no problems at all. Their 100% warranty keeps my mind at ease. You’re the BEST! They have excellent service with friendly staff and can cut your printing costs! I highly recommend them and I am confident that they will do their best to more than satisfy you. Ink Refill Center Thanks for your recommendation Dave! We love saving our customers money. I love this place I am saving tons of money on my ink. Deb Weaver is my sales girl and she will deliver to you at no extra charge. It is a pleasure doing business with the INK REFILL CENTER. Ink Refill Center It’s a pleasure doing business with YOU Melanie. IRC has the best customers! Awesome customer service! And the prices are very manageable compared to local stores! Ink Refill Center Hi Kasidy! The IRC Team loves interacting with our customers. Thanks so much for the review. Excellent customer service and quality of product is our top priority. September 4, 2015 · Great way to save money! Refill instead of replace. I have been a business customer of Ink Refill Center now for at least 4 years. Their customer service and delivery is outstanding!!!! No hassle…deliver right to my door! Many times same day but always next day latest! No hesitation in recommending them to every business owner! I had 1 cartridge that was bad 1 time in all those deliveries and they replaced it immediately! Lots of savings by doing business with them for many reasons! Ink Refill Center Thank you for your reviewTeri! On a daily basis, the IRC team is passionate about our quality of product and customer service. You are much appreciated! I love ink refills! when I need something that means most likely I need it same day or sooner! Ink refills has always delivered to me within a few hours of ordering and had great customer service and wonderful prices! Ink Refill Center Thank you Amanda! We appreciate that you took the time out of your busy day to give us this great review! Cant wait to serve you again. Vicki Wells reviewed Ink Refill Center. Ink Refill Center Thank you Tami!